AKRON, Ohio ― It was bound to happen ― you’ve found your first gray hair. It may remind you that the internal clock is ticking. You make a mental note to call the hairdresser for a dye job. Silver or gray is trending now in fashion, accessories and home decor. And while some local stylists say going gray naturally may be a trend, others say it can make a woman look 10 years older. Before you squeeze that tube of Vidal Sassoon on your locks, examine your shade of gray. Another exception is former Akron, Ohio, TV anchor and personality Robin Swoboda, who recently embraced the gray. But while her late mother was living with her last year, Swoboda noticed how her shiny white and silver hair made her eyes sparkle, and decided it was time to make a change. Letting gray grow out is a long process, explained Tim Pestian, a stylist at Georgie Salon & Spa in Fairlawn, Ohio. “It’s a journey, that’s for sure,” he said. Apparently, viewers liked the look. Reaction “was 98.9 percent positive,” she said. 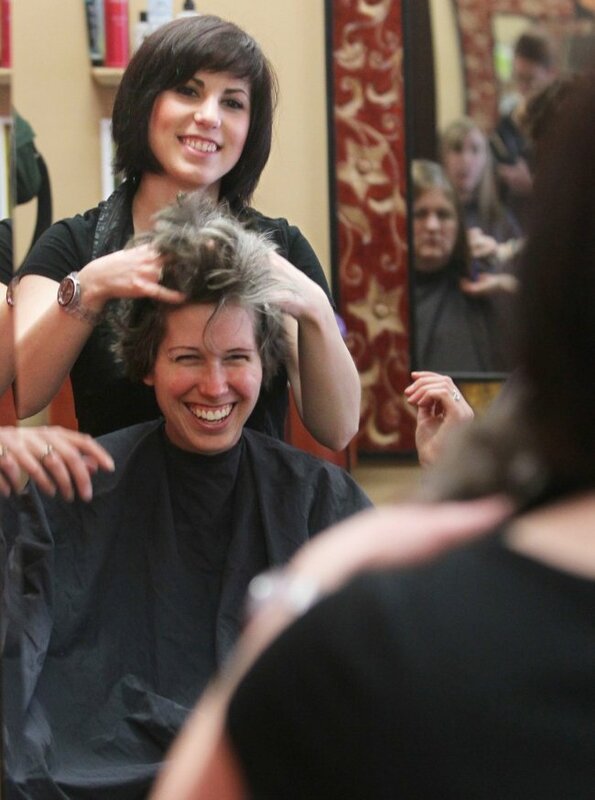 Like Swoboda, Michelle Touve-Holland of Streetsboro, Ohio, began going gray barely out of the starting gate of life. The 34-year-old has had only a couple of people suggest that she dye it. “They have since accepted it,” she said, chuckling. Both Parker and Warner understand why clients are interested in at least exploring their gray roots. Jackie Carris, owner of Creative Designers in Portage Lakes, Ohio, agreed. “You can’t convince me that it’s a good thing to go gray ― unless you are old. When you are in your 80s and you have pretty white hair, that’s one thing. As adults we shake our heads at those crazy kids with purple, pink or orange manes, but remember blue-haired ladies? The women, you might remember, were generally elderly with locks the color of a drop-in toilet freshener. And, no, it wasn’t a mistake. They made their hair that color on purpose. “That was way back in the day when everybody used a rinse that made their hair blue,” Carris said, laughing. Maybe going naturally gray isn’t so bad. Still, the majority of women, like Lorraine Fields of Uniontown, Ohio, are on a mission to keep it covered up. The hunt for camouflage was on, but it had to be cheap. She perused the aisles of a drugstore for a product with appropriate coverage, and enlisted her husband to help her color her locks. “Wow, what a dye job. ... Because of my cheapness, I had a brown side of hair, the other almost black, and a chemically burned scalp. The gray streaks (were) unscathed by the attempt to cover,” she joked, adding that she is heading to a salon to get the job done right. The thing to remember is that age is just a number, and hair color does not dictate whether you lead a sedate lifestyle or behave like a character in the “50 Shades of Grey.” The choice is yours.